Cathay Pacific flight bookings qualify to earn exclusive SouthAfrica.TO flight discount vouchers - email a writeup of yoru flight to cheapflights@southafrica.to and we'll send you travel vouchers. Don't be shy - ask for Help - our travel agents are itching to show you the best flight deal! Cathay Pacific(CX) is a Hong Kong based airline, which operates flights from Johannesburg to Hong Kong and onward to major cities in the rest of the world. It's the 3rd largest airline in the world, and is a listed company on the Hong Kong Stock Exchange, with Air China and Swire Pacific being significant shareholders (reciprocally, Cathay Pacific also owns a chunk of Air China). Cathay Pacific has recently been awarded as the sixth Best Airline at the Skytrax 2018 World Airline Awards. 15 August 2018 Cathay Pacific will launch seasonal direct flights between Cape Town and Hong Kong. They will operate three weekly return flights between 13 November 2018 to 18 February 2019. 4 May 2017 Cathay Pacific recently introduced their popular self-service bag-tag kiosk at OR Tambo Airport. The system is fully automated and allows passengers to check-in, print their boarding passes and baggage tags in one go. All economy class check-in desks have now be re-labelled as bag-drop counters. You'll find these machines near the Cathay check-in desk in Terminal B of OR Tambo. Someone will be on hand to assist in case you need assistance with the six-question machine. 29 January 2016 Cathay Pacific is rebranding Dragonair, their medium-haul subsidiary airline, to Cathay Dragon. The change in name isn't the only new thing, Cathay Dragon planes will also feature a red version of Cathay's white-on-green swoosh in place of the Chinese dragon. 25 September 2015 Yesterday a Cathay Pacific flight on route from Perth to Hong Kong had to undertake an emergency landing in Bali due to engine trouble. Various reports from passengers mention sparks and flames coming from the right-hand side engine. Cathay has denied all these claims, saying that at no point was the engine or the cabin on fire. Whatever happened, we're happy that all passengers landed safely and were able to leave Bali within 24 hours since their flight first departed Perth. 05 January 2015 Cathay Pacific's low-cost carrier Dragonair will soon be flying their new upgraded Airbus A320 jets. These feature new Business and Economy class seats and will stream WiFi entertainment. Business class passengers will be handed an Apple Ipad for entertainment during the flight. The new seats will also be equipped with two tablet holders in which economy class passengers can place their own tablets. There is currently no plans to extend these services and upgrades to Cathay Pacific. 10 November 2014 Cathay Pacific unveiled their new, updated logo. The new cleaner design is very similair to the original with the same brushwing logo and uses the same colours. This will be phased in over the coming 18 months. We look forward to seeing it in action! 2 September 2014 Cathay Pacific will allow the use of cellphones, tablets, e-readers and small game consoles during the entire flight from take-off to landing following the announcement by the Hong Kong Civil Aviation that it is safe to use. This will be effective from the 15th of September 2014. Devices must be placed in "flight mode" and all WiFi and Bluetooth funtions have to be disabled. Laptops have not been cleared for usage during landing and take-off as it is unsafe to do so when the trays are down. 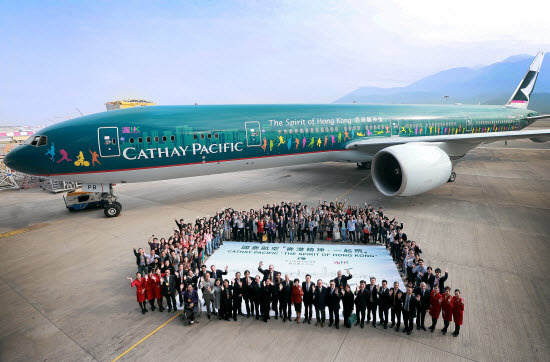 17 July 2014 Cathay Pacific has been awarded the Airline of The Year for the fourth time! They received the same honour in 2003, 2005 and 2009 from the World Airline Awards in London. This award is for excellence across all classes. Cathay Pacific has spent the last four years upgrading their cabins. It seems that the passengers are impressed with the changes. 12 June 2014 Cathay Pacific has appointed three new directors who will take up office this summer. In Sales and Marketing they have appointed Dane Cheng who has been with the company for 26 years. James Ginns will become the Director of Service Delivery and James Kong will fill the role of Director of Corporate Affairs. Collectively the three of them have almost 70 years’ experience in the industry and will surely take the company to greater heights (no pun intended). 12 May 2014 Cathay Pacific introduces digital magazines & newspapers to its airport lounges in Hong Kong. 9 March 2014 Cathay Pacific flight CX748 went through a flock of birds shortly after taking off from OR Tambo International Airport, with birds entering engine number 3 and number 4. The pilots shut down engine number 3, dumped fuel and landed safely at OR Tambo 90 minutes after taking off. 17 January 2014 Sometimes things slow down a bit - Cathay Pacific has announced that for the year ended 31 December 2013 their passenger numbers to South Africa & the South West Pacific was down -0.2%. Pretty flat results in contrast to the overall figure of being up 3.3%. 16 September 2013. Cathay Pacific (& DragonAir)'s South Africa & South West Pacific routes have had 5.5% more traffic in August 2013 than in August 2012, whilst capacity only went up 0.4%. 21 August 2013. Passenger number in July 2013 on Cathay Pacific's Johannesburg to Hong Kong flight route are 6.4% up over July 2012 (although the comparison is distorted by Hurricane Vincente's disruptions in July 2012). 21 August 2013. Severe Typhoon Trami is getting close to Taiwan, and so Cathay Pacific has canncelled a number of flights to Taipei. 14 August 2013. With Typhoon Utor nearing Hong Kong Cathay Pafici have cancelled a number of flights (including from Sydney, Taipei, Beijing, Narita, Singapore, Manila, Bangkok & Incheon). Cathay Pacific offers power outlets on all classes on long-haul flights, at a voltage of 110V AC. 14 August 2013. Cathay Pacific releases its 2013 interim results to 30 June 2013. Turnover is marginally down, but they've managed to switch from a HK$929m loss to a HK$24m profit. The airline cites an improvement in the passenger business being offset by weak demand for air cargo & the high price of jet fuel. Its introduction of a premier economy class in 2012 has improved yields. Cathay Pacific continue to invest in new planes, having taken delivery during the 6 months of 2 A330-300s, 3 B777-300ERs & a B747-8F. The airline also retired 4 B747-400s. 26 September 2017: 2018 will see Cathay Pacific adding direct flights to Brussels, Dublin and Copenhagen. Flights to Brussels will commende on the 25th of March, direct flights to Dublin will commende from the 2nd of June and the seasonal Copenhagen route will operate between 2 May and 12 October 2018. 27 October 2013: Cathay Pacific commences flights to the Maldives. 1 July 2013: Cathay Pacific increases its flights from Hong Kong to Bangkok from 42 to 47 a week, offering even more options for 1-stop flights from Johannesburg to Bangkok via Hong Kong. Cathay Pacific flight CX748 is scheduled to leave JNB every day of the week at 12h35 and land in HKG at 07h05. Flight duration is 12.5 hours and the planes used are Boeing 777-300ER and Boeing 747-400s. See our flights from Johannesburg to Hong Kong for a full listing of airilines flying the route (direct and 1-stop), or our flights to China page for a discussion of air connections between South Africa and China. the following morning. I took another Cathay Pacific flight to Pudong International Airport in Shanghai in a couple of hours. leg of the trip left Hong Kong for Johannesburg at around at around midnight, arriving at Oliver Tambo International Airport at around seven o'clock the following morning. In September 2013 Cathay Pacific redesigned its first class cabin using Foster & Partners (London-based architects) - the new first class cabins contain sculpted artworks, noise-cancelling headphones & points to connect ipods & iphones. Cathay Pacific planes are luxurious, even in the economy class. You can choose which movie or television program to watch on your individualized monitor. Among the more interesting movies I watched was one about four men incarcerated to Siberia at the height of communism who travelled south on foot all the way to India to escape the communists. Thirteen hours is a long time to sit in one place, so soon after a trip of similar duration. You can actually feel the cells in the tissues over pressure points threatening to go into hydropic degeneration due to pressure anoxia, which is the pathogenesis of bedsores and why recumbent patients are turned every two hours. The luxuries aboard made up for the physical difficulties of such a long trip. Online reservations at Cathay Pacific. 24 August 2016 - Cathay will increase their baggage allowance by 10 kg in each class on new tickets issued from the 15th of September 2016. Marco Polo Silver members will receive an extra 10kg, Gold members an extra 15kg, and Diamond members an extra 20kg. The changes also now place limits on the pieces of luggage. Business-, premium economy- and economy-class passengers will be able to check in two items free of charge, and travellers in first class can check in three items free of charge. Marco Polo Club Gold and Diamond members will be allowed an additional item on top of their normal allowance. Members of the Marco Polo Club have an additional baggage allowance, depending on the class of member.